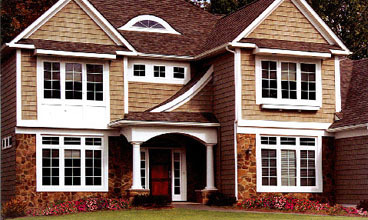 Suburban Construction and quality siding by Associated Materials Incorporated or AMI, set the standard by which other replacement sidings are measured. Today, our advanced technology delivers stronger, more rigid siding systems that hug the home tighter, as well as rich, long-lasting colors and subtle textures that capture the authentic look of wood. Trim and accessories are available in a full range of styles and complementary colors for a completely custom look. Manufactured to the highest quality standards, durable vinyl or steel siding from Suburban Construction not only adds value to your home, it saves you money on your energy bills and time on maintenance too. Please enter the number 73206 in the box provided below.